Fandango entertains, informs and guides film fans with must-see trailers and movie clips, exclusive and original content, insider news and expert commentary. We make it easy to find and buy the right movie at the right time, with showtimes and ticketing to more than 29,000 screens nationwide. Fandango is available online, and through our award-winning mobile and connected television apps with over 205 million downloads and counting. Purchase, acceptance or use of this Card constitutes acceptance of Fandango’s Terms and Policies (including, but not limited to, Gift Card Terms and arbitration and class action waiver provisions), viewable at Fandango.com. 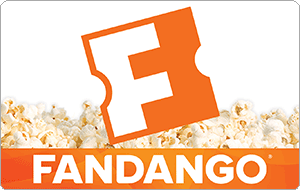 Card is redeemable only for purchase of movie tickets and convenience fees or purchase or rental of content on Fandango.com, FandangoNOW.com, and participating Fandango or FandangoNOW apps. Card cannot be used at theater box offices. For balance inquiries, please visit fandango.com/giftcardstatus. Card is not refundable or redeemable for cash, except as required by law. Card is not reloadable and cannot be replaced if lost or stolen. Card does not expire and is not for resale. Void where prohibited. Card is issued by, and is solely a legal obligation of, Fandango Marketing, Inc. and is subject to the laws of Virginia. © 2018 Fandango Marketing, Inc.